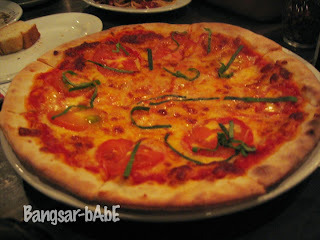 I met up with Jeen and a few other friends for dinner at Italiannies before she went back to Sydney. The pastas were mediocre. 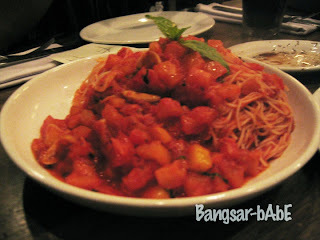 The angel hair pomodoro lacked flavour and was slightly overcooked. 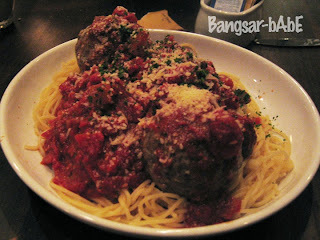 The spaghetti with meatballs fared better (not by much) because of the gigantic meatballs. Those were nice. Well-seasoned, juicy and firm to the bite. Pizza was bleh…nothing like the real thing in Rome. We also had Marsala Mushroom Soup which I didn’t take a picture of. Again…nothing to shout about. 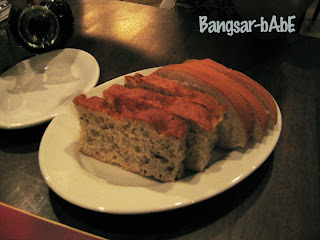 The meal came up to RM 166.40 including tax and service charge for 6 of us. I thought the service wasn’t up to par. There were only 3 to 4 tables occupied yet the waiters were inattentive. I had to wave so many times just to get their attention.